Why? | Know Your Rights! Know Your Rights! was initiated because today’s secondary school students are the least knowledgeable about their First Amendment rights in decades. Are class was asked whether had more or fewer rights since the Tinker case in 1969. By a show of hands, about 50% of the class swayed one way, and 50% the other. Clearly, no one was quite sure of their rights. Schools don’t do enough to teach the First Amendment. Students often don’t know the rights it protects. This all comes at a time when there is decreasing passion for much of anything. And, you have to be passionate about the First Amendment. According to the Intercollegiate Studies Institute, only 49% of graduating university students know that the Bill of Rights explicitly prohibits establishing an official religion for the United States. The Associated Press conducted a study and found that students feel the First Amendment is a second rate issue and that activities such as burning the flag are illegal and not protected by free speech. In a University of Connecticut survey, just half of surveyed students felt that the media should be allowed to publish freely without government approval of stories. 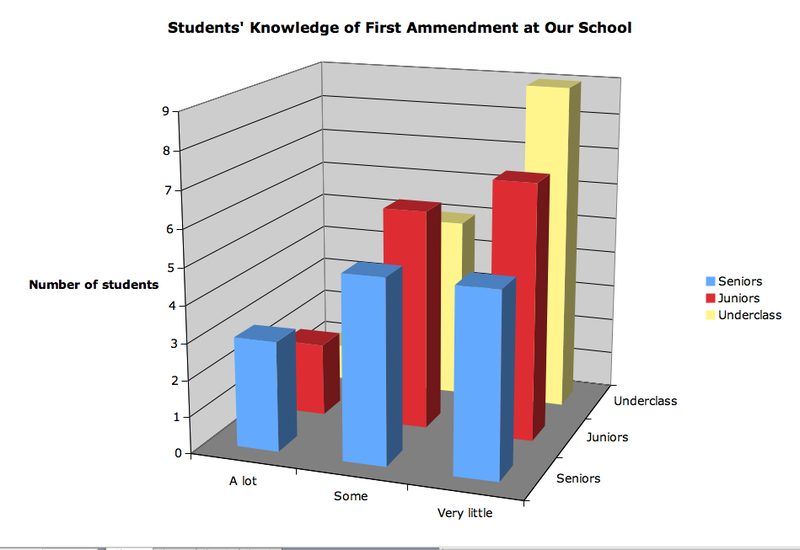 We asked a sample population of students at our school how much they knew about the First Amendment to the US Bill of Rights.